Unsettled weather is quickly organizing well away from the coast of Mexico. 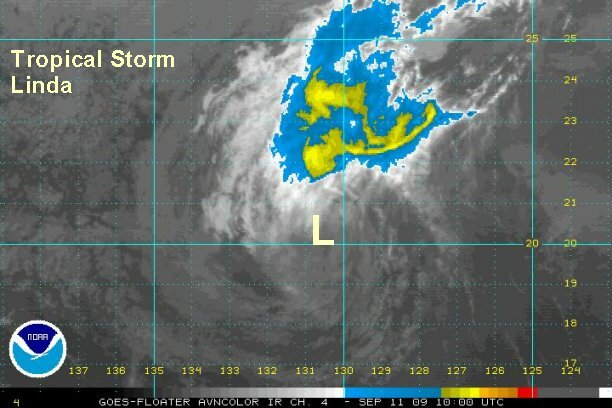 NHC will likely classify this as the next tropical depression or even tropical storm on the 2 pm pdt advisory. Deep convection is surrounding the surface center and additional development is likely. As of 12:00 pm edt / 9:00 am pdt the tropical disturbance was centered near 14.5° N / 124.0 W or about 1080 miles southwest of Cabo San Lucas, Mexcio. Top sustained winds are estimated at 35 mph and increasing. It is moving west at about 15 mph. 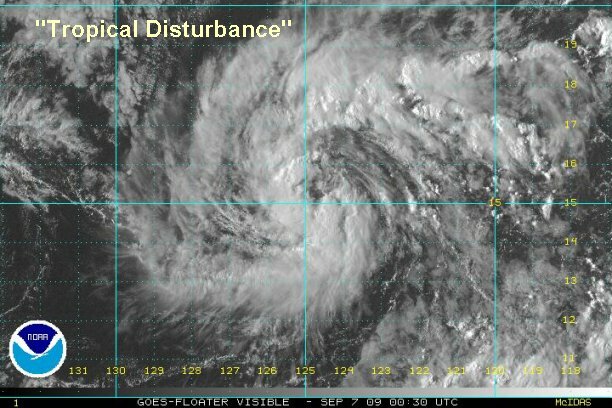 It appears that our tropical disturbance is now tropical storm Linda despite NHC not classifying it yet. Nice rotation is now noted at the surface. Quickscat satellite estimates 40 knot winds with an impressive low level circulation. This system should be at the bare minimum officially a tropical depression. As of 8:30 pm edt / 5:30 pm pdt the tropical disturbance was centered near 15.3° N / 124.7° W or about 1090 miles southwest of Cabo San Lucas, Mexcio. Top sustained winds are estimated at 45 mph and slowly increasing. It is moving west northwest at about 11 mph. 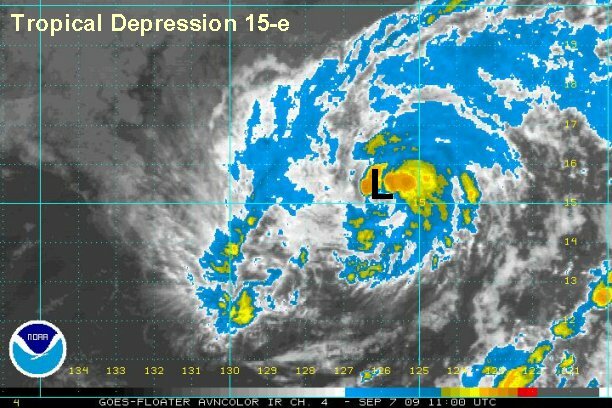 Tropical depression 15-e was officially classified on the last NHC advisory. It is interesting to note that the convection has decreased over the last several hours. We believe that this system was a minimal tropical storm several hours ago and now has weakened into a tropical depression....thus agreeing with the National Hurricane Center of a 35 mph tropical depression! 15-e still has time to regenerate into a tropical storm as it harmlessly move in the open Pacific. As of 8:00 am edt / 5:00 am pdt tropical depression 15-e was centered near 15.5° N / 125.8° W or about 1150 miles west southwest of Cabo San Lucas, Mexico. Top sustained winds are estimated at 35 mph. It is moving west northwest at about 8 mph. Even though the banding has improved today on tropical storm Linda, deep convection is not as impressive. There is convection wrapping around the center but not worthy of 60 mph wind speeds in our opinion. As of 5:00 pm edt / 2:00 pm pdt tropical storm Linda was centered near 15.5° N / 127.0° W or about 1225 miles west southwest of Cabo San Lucas, Mexico. Top sustained winds are estimated at 50 mph (NHC 60 mph). 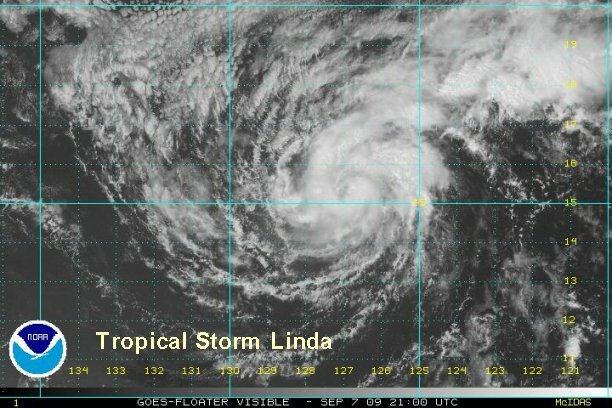 Linda is moving west northwest at about 7 mph. 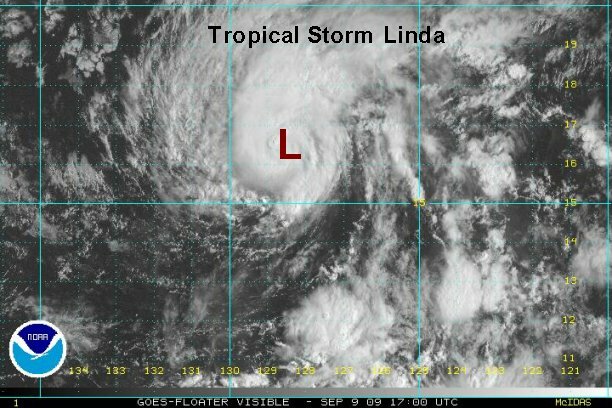 Overall the strength of Linda has not changed much overnight. Linda briefly had some deep convection building around the center of circulation. Northwesterly wind shear picked up and has once again weakened the sturcture. No net gain or loss from our last update. We still think that the Hurricane Center is overestimating the strength. Recent satellite estimates show 41 knots, so our 50 mph sustained winds may be slightly generous. As of 8:00 am edt / 5:00 am pdt tropical storm Linda was centered near 15.1° N / 128.5° W or about 1330 miles west southwest of Cabo San Lucas, Mexico. Top sustained winds are estimated at 50 mph (NHC 60 mph). Linda is moving west at about 8 mph. Linda has weakened a touch today and has almost stopped. NHC has winds estimated higher we do. We just don't think that the convection supports this strength. It is interesting to note that a false eye has formed. This is not a true eye but center of circulation. As of 5:00 pm edt / 2:00 pm pdt tropical storm Linda was centered near 15.5° N / 128.4° W or about 1310 miles west southwest of Cabo San Lucas, Mexico. Top sustained winds are estimated at 45 mph (NHC 60 mph). Linda is drifting northwest at about 2 mph. Linda is still struggling and not looking very organized. We are still confounded by NHC's strong wind estimates of Linda. The last two recent Quickscat passes showed one 50 knot wind estimate. That is certainly weaker than the 65 mph sustained winds estimated by NHC. A gust of 75 mph should be noted with winds that strong. We are going with lower winds of 45 mph sustained with some gusts up to 55 mph, which would match that one 50 knot wind estimate. As of 5:00 am edt / 2:00 am pdt tropical storm Linda was centered near 15.8° N / 128.4° W or about 1300 miles west southwest of Cabo San Lucas, Mexico. Top sustained winds are estimated at 45 mph (NHC 65 mph). Linda is drifting north at about 2 mph. After looking disorganized for quite awhile, Linda has finally organized today. Deep convection is building near the center of circulation and our wind estimate is the same as NHC's. Microwave satellite estimates are near 60 knots. As of 3:00 pm edt / 12:00 pm pdt tropical storm Linda was centered near 16.8° N / 128.7° W or about 1270 miles west southwest of Cabo San Lucas, Mexico. Top sustained winds are estimated at 65 mph (NHC 65 mph). Linda is moving north at about 5 mph. 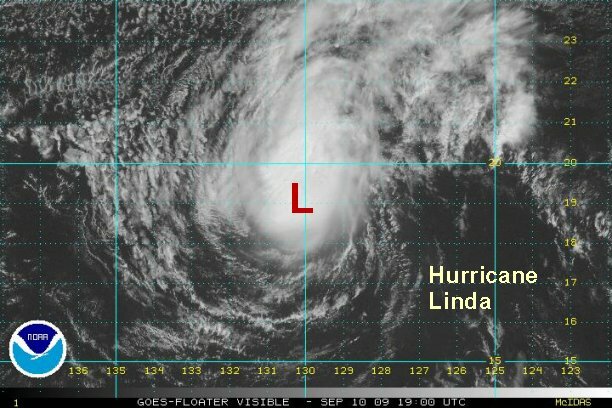 Linda is now organized enough to be classified as a hurricane. Microwave estimates have winds near 70 knots. The recent strengthening will not be long term. Upper air wind shear and cooler ocean water will rob Linda's energy over the next few days. This system is NOT a threat to Mexico or Hawaii. 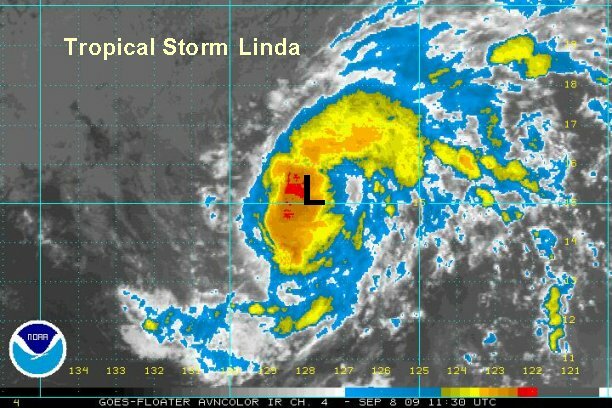 As of 7:00 am edt / 4:00 am pdt Linda was centered near 17.9° N / 129.7° W or about 1320 miles west southwest of Cabo San Lucas, Mexico. Top sustained winds are estimated at 75 mph (NHC 80 mph). Linda is moving northwest at about 8 mph. Linda is starting to move faster with signs of increasing southerly wind shear starting to show. 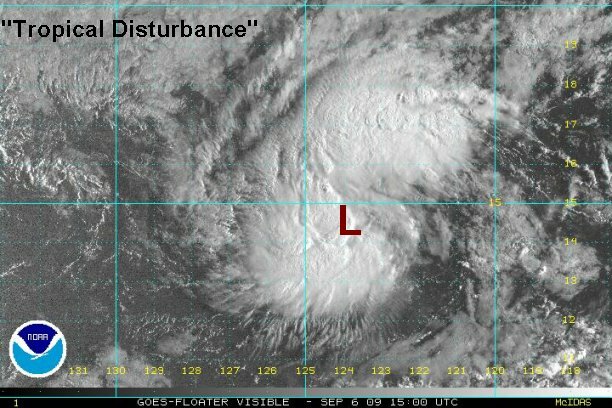 It appears that Linda has weakened to just below hurricane force and this trend is expected to continue. 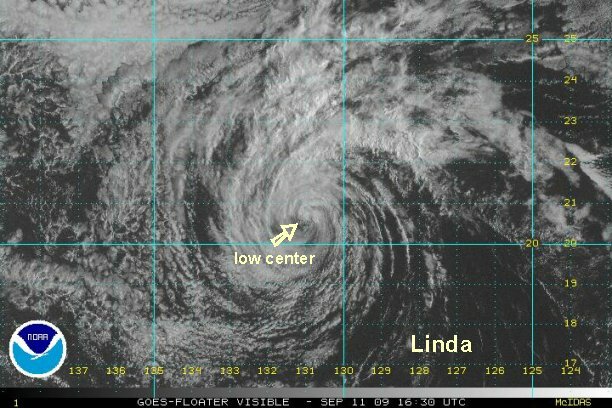 As of 4:00 pm edt / 1:00 pm pdt Linda was centered near 19.5° N / 130.2° W or about 1320 miles west of Cabo San Lucas, Mexico. Top sustained winds are estimated at 70 mph. Linda is moving north northwest at about 12 mph. The National Hurricane Center dropped their winds to 75 mph on the 5 pm edt /2 pm pdt advisory to more closely match our wind estimate. Wind shear has pushed just about all of the deep convection north of the center and Linda is weakening very rapidly. At this rate Linda will no longer be a tropical storm in a few hours. We are estimating winds weaker than the National Hurricane Center as convection is rapidly declining. 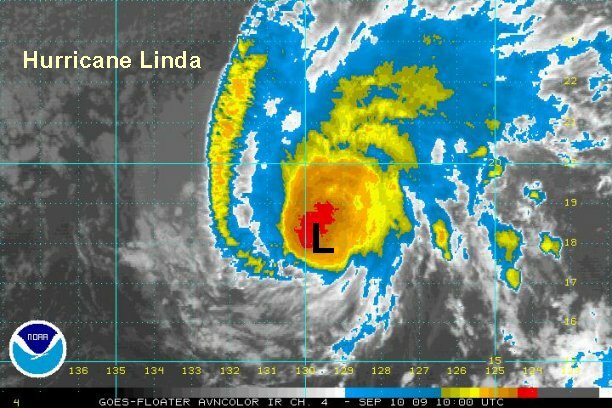 As of 7:00 am edt / 4:00 am pdt Linda was centered near 20.1° N / 130.8° W or about 1360 miles west of Cabo San Lucas, Mexico. Top sustained winds are estimated at 40 mph (NHC 50 mph). Linda is moving north northwest at about 7 mph. The only deep convection remains well north of the circulation center. 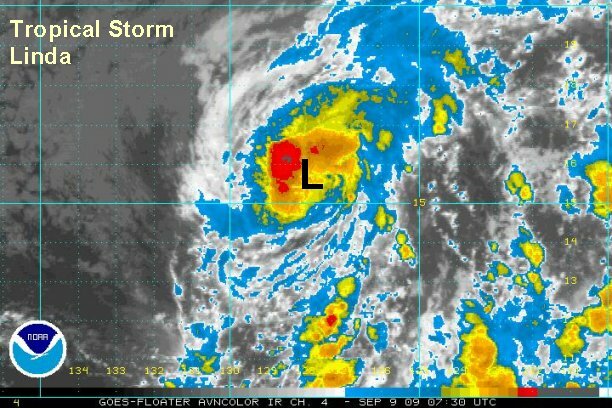 We believe that Linda has declined below tropical storm strength. 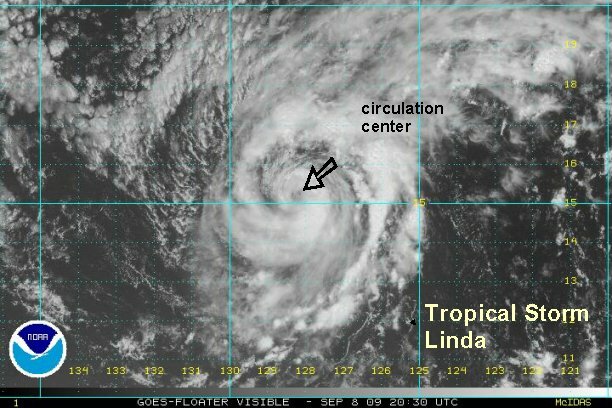 As of 1:00 pm edt / 10:00 am pdt Linda was centered near 20.7° N / 131.1° W or about 1365 miles west of Cabo San Lucas, Mexico. Top sustained winds are estimated at 35 mph (NHC 45 mph). Linda is moving north northwest at about 7 mph. This will be our last update on Linda.